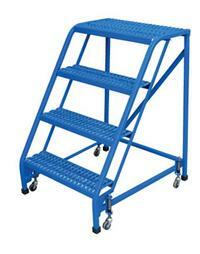 Portable warehouse ladder for every-day use. Heavy-duty uniform weight capacity is 350 lbs. Features 60 degree standard climb angle. Choose either perforatedor Grip-Strut steps. Step depth is 7" with a top step depth of 14". Weleded square tubular steel construction with powder-coat blue finish. Rubber feet provided for floor protection. 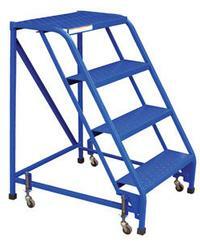 All ladders have spring-loaded caster. Ships fully assembled.